Californians alone owe more than $400 million in medical debt. Now, NBC4 is doing something about it. Jessica Dean couldn't have foreseen the life-changing impact that one misstep would have on her life when she stepped off a curb in 2015. A year earlier the personal chef had already begun caring for her mother, who suffers from Alzheimer's disease. Things only got worse when Dean flew forward off that curb, breaking and dislocating her ankle. Dean's ankle required two surgeries and rehabilitation. It was a year before she was ready to return to work, but by then she no longer had a job. That's when her medical bills began pouring in. Dean's ambulance ride alone cost $3,000, and the debt collectors were calling. "It felt like my world was shattering. I really honestly was like, 'I don't know how I'm going to pay for this,'" she said. "I didn't know what I was going to do to get by because at this point we were already living on credit cards." Dean had been plunged deep into a problem that plagues one in five of Americans. Medical debt is the number one cause of bankruptcy for people in the United States. Californians alone owe more than $400 million in such debt. "You're one illness away or one accident away from financial ruin in this country," said Craig Antico. Antico used to be a debt collector. He said business was good because so many Americans have medical debt. "Fifty percent of all collections in this country are medical," he said. For those who can't pay, their debt can be bought and sold to collectors for pennies on the dollar. It costs collectors next to nothing while people drown in bills. For just $10, a collection agency can purchase $1,000 worth of debt, an amount that increases at 12 percent interest annually. In 2014, Antico switched sides, founding the charity RIP Medical Debt, which uses donations to purchase debt portfolios identifying the people who need the most help. "We actually put (the debt) in our debt cemetery and it's history," Antico said. "No one can ever collect on it again." It's a gift of mercy, the kind that could save someone like Dean from years of anguish. Dean said she has "amazing" friends who keep her positive and strong, but those friends can't pay her bills. Dean's debt now sits at $12,000. She has been piling it on credit cards and transferring balances, but she is financially in the red every month. Her mother's health won't improve. There's no end in sight. NBC4 believes the lives of people like Dean shouldn't be destroyed financially because they get hurt or sick. That's why we have decided to do something amazing. 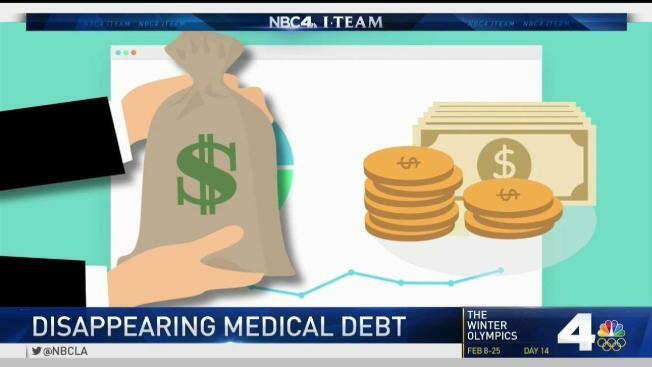 NBC is making a $150,000 donation to RIP Medical Debt that will buy and forgive $15 million in medical debt. The donation will help thousands across the country, more than 2,000 of whom are right here in Southern California. If you want to join NBC4 in changing people's lives, you can make a direct donation to RIP Medical Debt here. This is all about giving back, and we hope you will join us in paying it forward.